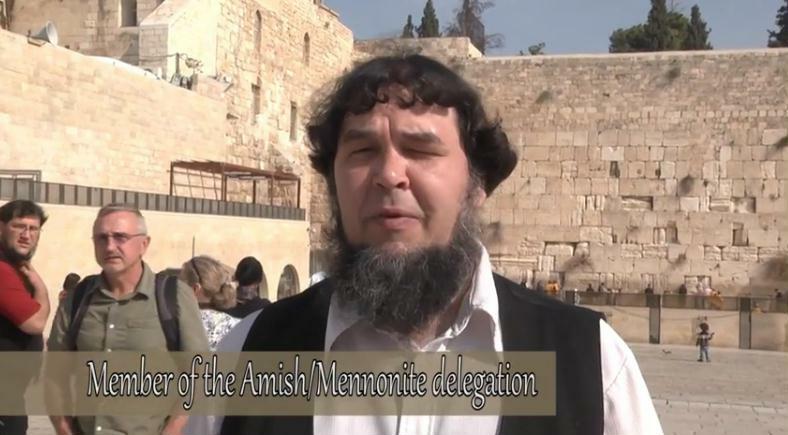 A delegation of Amish/Mennonite communities visited Israel in November 2012 to express their commitment to Israel and the Jewish People. Although there is no shortage of extraordinary sights at the Wall, the visit by a group of 31 Amish people (29 Americans and 2 Canadians) had people staring in wonder as the group filled the air with their heartfelt hymns. The group came to Israel to apologize to the Jewish people for not previously recognizing the Jews as the chosen people and for not doing more to prevent persecution of the Jews in the past. The group expressed the purpose of their visit: "We would like to meet and bless the people of Israel, to show our support, especially in the area of repentance, and acknowledgment of our errors, such as having rejected them as God's chosen people." "We would like to meet with city officials and other leaders who would give us a few minutes of their time. We, the Amish and Anabaptist people turned away from Jewish nation, while they were in their darkest hour of need. We hardened our hearts against them, we left them - never lifting our voices in protest against the atrocities that were committed against them. We want to publicly repent of this and acknowledge our support of Israel." This video shows the group united in song at the Western Wall. Just beautiful. If more people felt like the Amish there would be a chance for peace on earth.